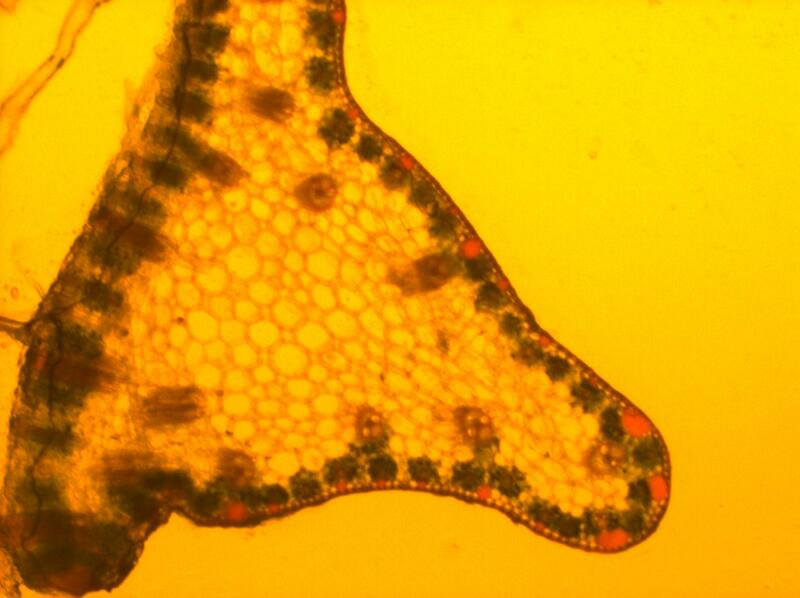 In this experiment, image processing techniques are applied to learn about lignin quantification in stained plant tissues. To quantify the lignin present in the tissue sections using online software. Phloroglucinol stained lignin sections is imported into the software. Split the images into different channels inorder to convert the image into three styles (blue, green and red). A clarified image is selected and the contrast is adjusted in such a way to obtain a clear lignin stained region. Set the measurements to analyze the percentage of lignin stained region in the total tissue section. Lignin is a chemical compound derived from wood and is found in the secondary cell walls of plants. It is a polymer of aromatic subunits derived from phenylalanine. Lignin is found in the spaces in the cell wall between cellulose, hemicelluloses and pectin components. It constitutes about 30% of dry weight in woody plants and is the most abundant organic compound after cellulose. The lignin content varies considerably even within plants of the same species. Lignin is a complex polymer formed by the condensation of precursors like coniferyl alcohol, coumaryl alcohol and sinapyl alcohols. Lignin is indigestible by animal enzymes but some fungi are able to secrete enzymes which can biodegrade the polymer. It is slowly decomposed in the soil and finally forms the humus. Lignin is a complex constituent in the secondary wall of plant cells. When phloroglucinol-HCl reagent is added over the tissue sections, the cinnamaldehyde group of lignin reacts with these reagents to give a red-violet colour which can be visualized microscopically. Although the reaction is not very sensitive, because of the ease of staining, this procedure is still often used as one of the tests for the presence of lignin in plant cell wall. Lignin plays a crucial part in transporting water to the plants and is more hydrophobic in nature. The presence of cross linking of polysaccharides by lignin is one of the obstacles for the absorption of water to the cell wall. It also serves as an important function in plant defense. Due to the complexity and insolubility of lignin it is resistant to degradation by most microorganisms. This resistance to micro organisms will enhance its persistence in the soil. In paper making process, the lignin is removed for the conversion of wood into pulp and paper. Image analysis has become a very powerful tool for the quantification of various cell biology and molecular biology techniques. The quantification of lignin in the Phloroglucinol stained tissue section can be done with the help of softwares. ImageJ is probably the cheapest and easiest way to quantify the lignin. The ImageJ tool helps in the percentage wise quantification of lignin against the total selected region for quantification. It also helps to provide a more precise and detailed data of the image regarding its area, intensity etc. While analyzing tissue sections, it is important to wash the sections properly to get more accurate result.